Tour through the 16 exhibition venues with lots of information. We show 126 artworks of 92 participants, ca. 320 photos and 25 videoclips. With organizers and curators of Biennales. Organized by: ifa (Germany), AICA-Section Singapore, Universes in Universe, ICA Lasalle-SIA. Through a selection of international contemporary art practices, SB2006 aims to address the complexities that surround and inform some of these questions, also examining aspects of belief in relation to the system of art itself and the inherent values of contemporary art. The artistic director, the renowned Japanese curator and art critic Fumio Nanjo, and his curatorial team have conceived a Biennale for diverse venues, including museums, religious spaces, public institutions and disused buildings. 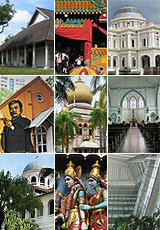 The pathway of the audience across the city is part of the concept, providing an insight into one of the unique features that characterize Singapore as a multi-cultural society, where many beliefs co-exist alongside one other. Some of the venues also provide points of departure for a critical reflection on the role of architecture in the construction of belief and ideology. SB2006 coincides with "Singapore 2006: Global City. World of Opportunities", where Singapore plays host to the Annual Meetings of the Boards of Governors of the International Monetary Fund (IMF) and World Bank Group. The Annual Meeting is an important forum for international cooperation where representatives of the 184 member countries unite to discuss the course of global economic development and challenges facing the world today. To keep informed about updates on these pages, and in other sections of Universes in Universe, please subscribe to our free Newsletter. The facts have been compiled from information of the organizer and other sources. We do not assume responsibility regarding the correctness of this information. See the Disclaimer.